13 1/2” X 18 1/8” serigraph print--historic design; contemporary colors. This view shows the original cave entrance. This is one of three posters in this series that exists only in a black & white photograph--no originals have survived. The colors are estimated from period park brochures. 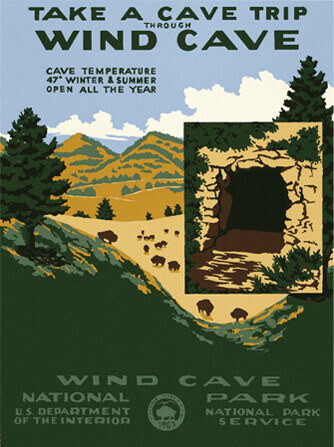 Wind Cave has been protected since 1903 when it became our seventh oldest national park.